Veluxsys by PrecisionOT is a system integrator of RFoF products within the defense space. Our RFoF transmitter/receiver package uses integrated photonics to improve data transmission for a variety of defense applications, including the aerospace sector. Backed by expertise in fiber optic networks through Precision OT, we are working to partner with defense-related entities, including contractors, to integrate our RFoF technologies into their equipment. 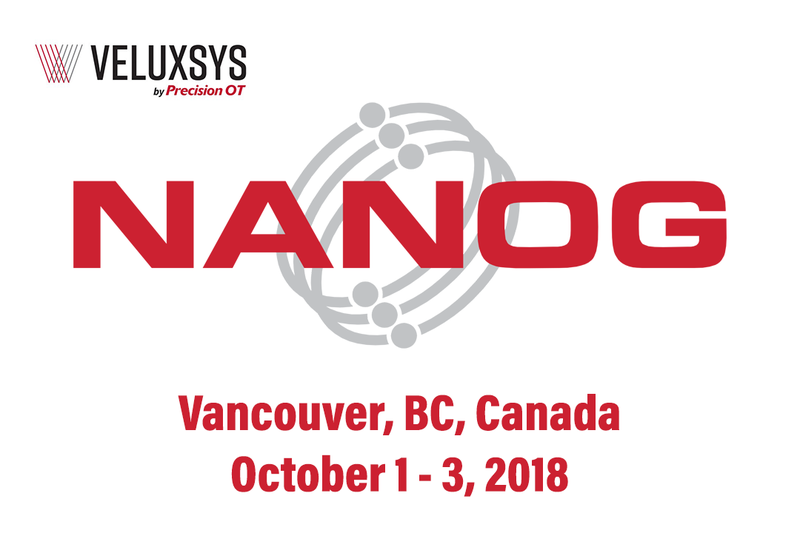 NANOG 74 Hackathon will take place September 30, 2018 and the NANOG 74 conference is October 1-3, 2018. Both will offer a great opportunity to network with colleagues, freshen-up skills, learn advanced networking techniques, and discover new network applications. NANOG 74 will be followed by ARIN 42. We will be gathering at the Hyatt Regency Vancouver. Vancouver has the mildest climate in Canada, and is the third largest film production center in North America. Recently dubbed a new tech hub offering world class talent, downtown Vancouver is home to many companies across all sectors of the industry. We’ve just launched at Veluxsys, but we’re making strides to connect with venture resources that can help us accomplish our mission. If you’re interested in learning more about how you can provide resources that will contribute to our growth, please contact us.